Rent Bull Riding for tough cowboys or rodeos for junior cowboys – whatever steadiness, Xtreme Events offers a suitable difficulty level. Besides “animal” rodeos like the Horse Rodeo, the Camel Rodeo or the Christmas Reindeer Rodeo, Xtreme also offers Soccer Rodeo – a must-have for every fan area. 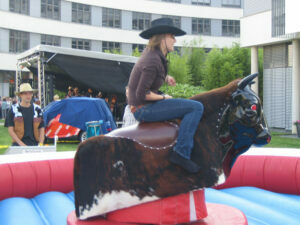 Optionally, you can rent inflatable event pavilions as part of our rodeos, which are ideal for rain protection. Physical activity is warmly welcome – our bull riding sport modules like the Snowboard simulator or the Surf simulator make things hum. Rent the Extreme rodeos – start a rental enquiry now.